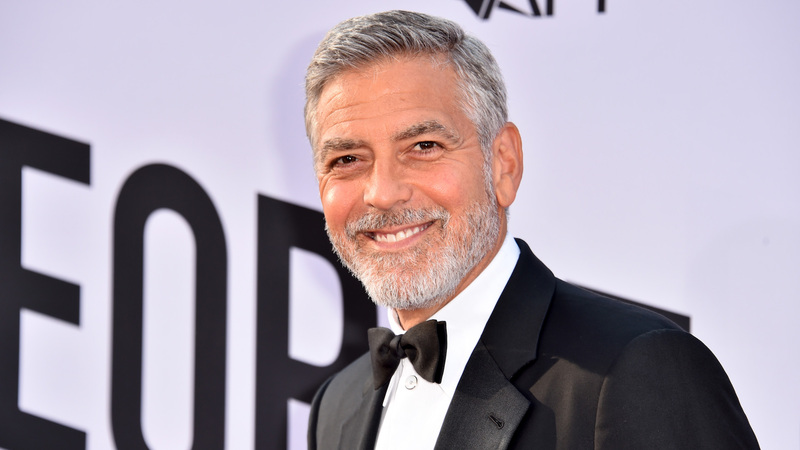 On Wednesday, Forbes released their annual world's highest-paid male actors report, and while most would expect to see dudes like Chris Hemsworth or Ryan Reynolds top the list — you know, just some of the biggest stars right now — the highest-paid actor is a familiar face, albeit a still surprising one: George Clooney. According to Forbes, Clooney made $239 million from June 1, 2017, to June 1, 2018. However, the bulk of his take-home pay wasn't from acting; instead, he landed the No. 1 spot on the list because he sold his tequila company, Casamigos Tequila, for an estimated $233 million. Coming in at No. 2 is Dwayne Johnson, who made $124 million thanks in large part to Jumanji: Welcome to the Jungle, and Robert Downey Jr., Chris Hemsworth and Jackie Chan rounded out the top five — with $81 million, $64.5 million and $45.5 million respectively. Of course, this isn't the first time we are hearing about the world's highest-paid actors this month. Just a week prior to the male actor list hitting the internet, Forbes released their world’s highest-paid female actors list, and that also contained some surprises. Scarlett Johansson nabbed the top spot, reportedly pulling in $40.5 million from 2017 to 2018. Angelina Jolie came in second, netting $28 million, and Jennifer Aniston slid into third with $19.5 million. And while this may all sound inconsequential to us (because how many of us are lucky enough to deal with salaries in the millions? ), there is something striking about these two lists that we just can't seem to get over: the very large and very obvious pay gap. You see, if you tallied up the amount the world’s 10 highest-paid male actors made versus the amount the world’s 10 highest-paid female actors made, you would notice a glaring difference: The men made $748.5 million between June 1, 2017, and June 1, 2018, while the women made just $186 million. If you just compare Clooney and Johansson's salaries, Clooney made nearly six times as much as Johansson did in the course of a year — what the heck is that nonsense about? And while there are numerous reasons such a gap may exist, in Hollywood and beyond, according to the American Association of University Women, the predominant reason for the discrepancy is one of gender: "[W]omen working full time in the United States typically were [and are] paid just 80 percent of what men were paid," and that gap is worse for Black women, Native American women and Latinas. Worse still, older women suffer from a far steeper divide overall. Of course, the Hollywood pay gap could be attributed to a lack of opportunity for women to get work in Hollywood. According to a 2015 Forbes article, "[W]omen [remain] grossly underrepresented in film, television and comedy"; however, I think this explanation is too easy — and quite frankly unacceptable — because if the gap is due to a lack of work, we need to demand the work (in this industry and beyond). So, while we are happy for Clooney (and everyone on these lists), it is time for the entertainment industry to be better and do better by its female performers who dedicate the same amount of time, sweat and effort as their male peers do.